For once I don’t have much to say. Luckily the rain has been falling and the flowers on this beautiful mountain speak for themselves. This is the exquisite Morea tripetala that grows all over the farm. It is tiny, like a little iris. The delicate Stachys aethiopica grows all through winter and spring along damp banks. Being delicate it sways in the slightest breeze which makes it difficult to get a perfectly focused photograph. Of course we should be famous for our Ericas. We have dozens of different varieties and this, Erica plukenetii, has just begun its long flowering season. It comes in white and a particularly delicate shade of pink. It’s supposed to flower all year round but here on the farm it likes the cool damp of winter and the gentle warmth of spring. I’m not sure I’ve seen this before. I think it may be a Geissorhiza but I am not sure which one. 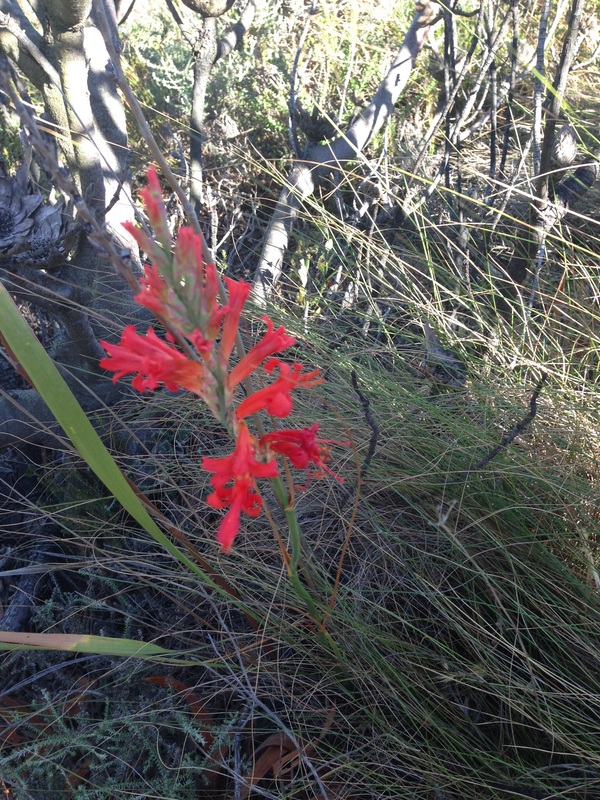 There are 80 fynbos species so that’s not entirely surprising. I must post it on iSpot and see if the experts can tell me. The proteas and leucadendrons have been fabulous on evening runs. 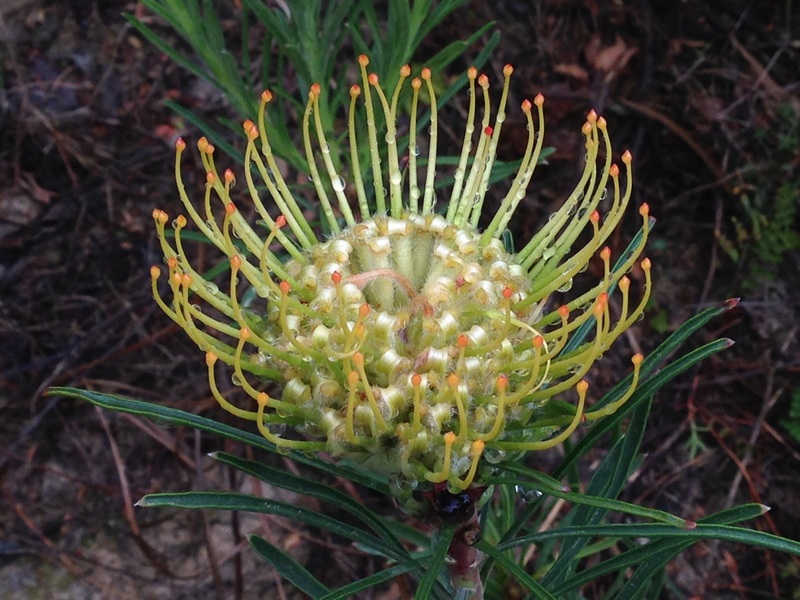 Lucadendron salignum, Protea nerifolia, and Protea nitida. 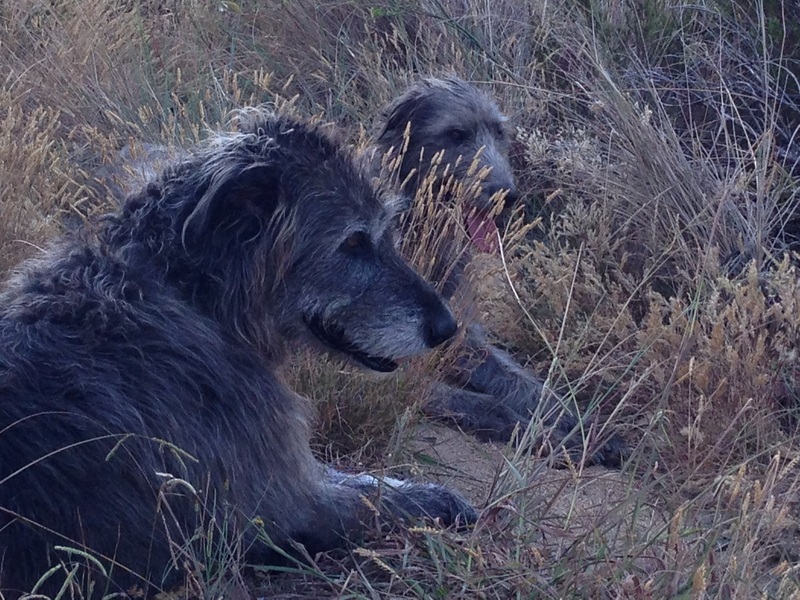 Finally, Seamus the wolfhound, legend of many many spectacular runs on this farm is not well tonight. 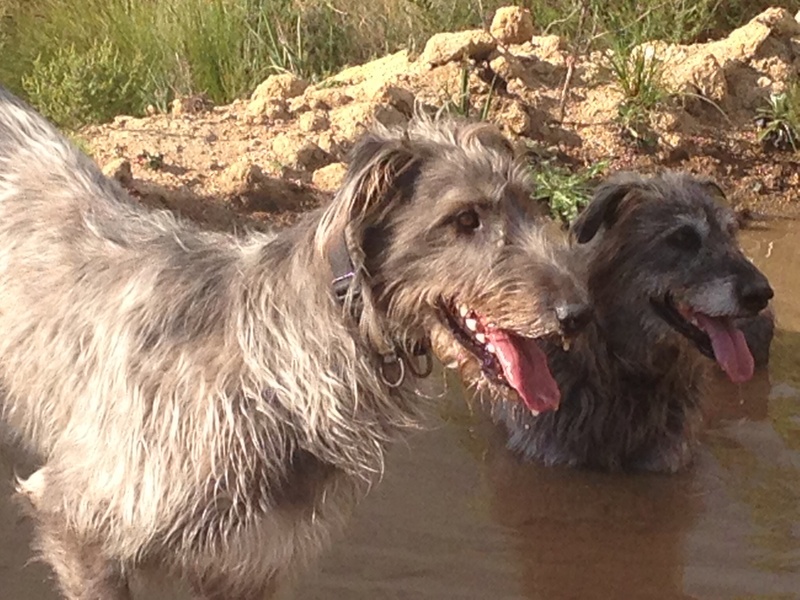 Wolfhounds are susceptible to heart conditions and at nine years old it is not surprising that his heart is not the best. He hasn’t been running on the mountain for the past year; here is a photo from a recent stroll, I hope we shall have many more. Yesterday, March 2nd 2015, was the hottest day in Cape Town for 100 years. Fires raged on the Cape Penninsula and we could do nothing but think of our poor friends all over the Cape evacuating their homes, of the animals that had to be evacuated and of the wildlife on the mountains that must be suffering terribly. In many areas all that is left is a bare lunar landscape. This blog is dedicated to all our friends who have been battling the fires for the last three days. All the more terrifying because we live on a mountain that is overdue a big fire, and beside a huge pine forest. As we worried about our friends yesterday a small fire broke out on our mountain, but was quickly contained by our local fire services. The strange weather has contributed; on Sunday this wild windy sunset light the sky, and was followed by unbelievable howling winds that stripped the young olives off our trees. The wind howled all day on Monday and then dropped in the evening, to be followed yesterday by a day of searing heat all over the province. We quite often get temperatures of over 40 degrees down in the valley, but almost never here on the mountain. It was 42 all over the Cape yesterday, even here on the farm at 5 pm as we wound down from a long hot day. As quickly as the heat appeared it was gone. This morning was remarkably cool and I went for a long run with the dogs. The sky was cloudy and drops of rain spat from the sky. This weather is most bizzare. There are not many flowers on the mountain, but some signs of life to come all the same. A pink tipped Protea Repens and a Pelargonium that can flower all the year round but still amazing that this plant should choose this hottest driest month to show it’s enchanting face. The air was still and cool but the remains of the great heat still came as a powerful beat from the earth; there is no proper rain in the forecast and we can only pray that the Gods are kind to us and that fire does not come to claim us this year. What a busy week it has been. I must apologise to friends who prefer the chatty blog to the technical botanical blog. At this time of year there is so much to share, so we have a botanical phase for now and more chat will inevitatably follow. Although I have been wanting to post a collection of flowering bulbs for some time there was a small problem with identifying one or two. The best way to get help is to post on ispot, where the South African flora and fauna geeks all post their sighting and help one another out with identification. Sure enough, within a couple of days I’ve had some help and can now happily identify a paricularly pretty apricot flower as yet another Moraea, this time miniata. The other one is our most common gladiolus, which the experts identify as the famous and common Painted Lady, Gladiolus carneus, known as the White Afrikaner. This must be right yet it is also frustrating as the books insist on the red splash on the lower petals while mine splash yellow. Everything else fits though and they are just coming into flower now so I’ll be on a determined hunt for red splashes and I’m sure over the next few weeks I’ll post a few more photos of this really stunning Gladiolus. Running last week was great from a running point of view as the weather was dry and windy and I have learned that taking pictures of flowers is best left for days with little or no wind. The dogs loved the faster pace and once again we had a photogenic moment when Seamus and Maebh stopped at Fox Pan for a drink as we ran up the dry side of our farm. 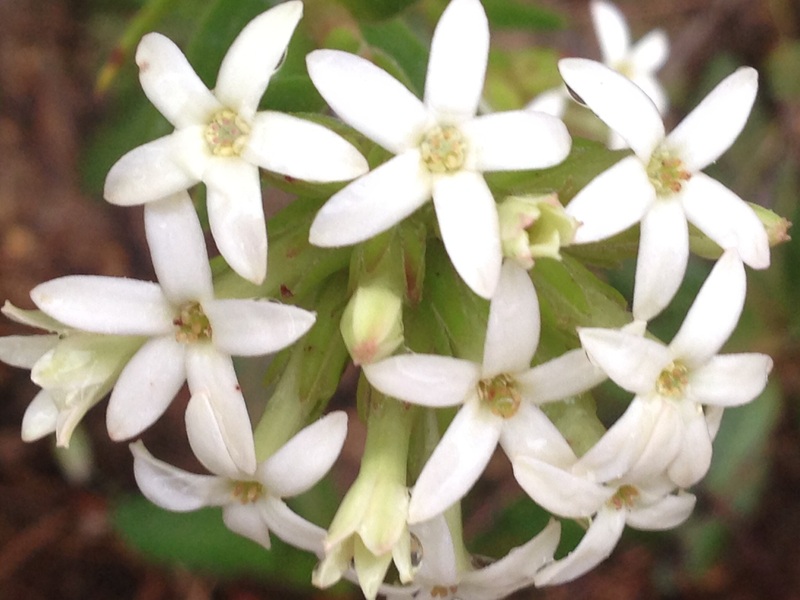 There is such an abundance of flowers this year and every step of the run means another group or another flower. There are shrubs I haven’t stopped to photograph because I think, they’ll still be there in a couple of weeks. Flowering bulbs are different, they have a short life and you only get a few days to capture them. I know I don’t see them all, for example last year I completely missed this dramatic Moraea bellendenii and this lovely Aristea spiralis which both flower at the same time, when I was away. Other bulbs that flower at this time of year include Geissorhiza aspera, which opens when the sun shines and covers the lands in blue stars. And yet another Aristea, the pretty Aristea africana, which is often used in gardens. The pink Wurmbea punctata is much less common and easy to miss, it’s snuggled up to several shrubs along a busy road and there are very few of them. The Baeometra uniflora which is not very prettily known as the Beetle Lily, it is choosy about where it lives and grows prolifically in one specific spot. There are a couple more I don’t have names for, I’ll see if the geeks can help. This first one is tiny – the flowers are less than half the size of the nail on my little finger. I really should be able to name the second one, but there are quite a few flowers that look like this, so I’m not sure. And the third one is the most exquisite little thing – also tiny. Finally, two distinctive peas. 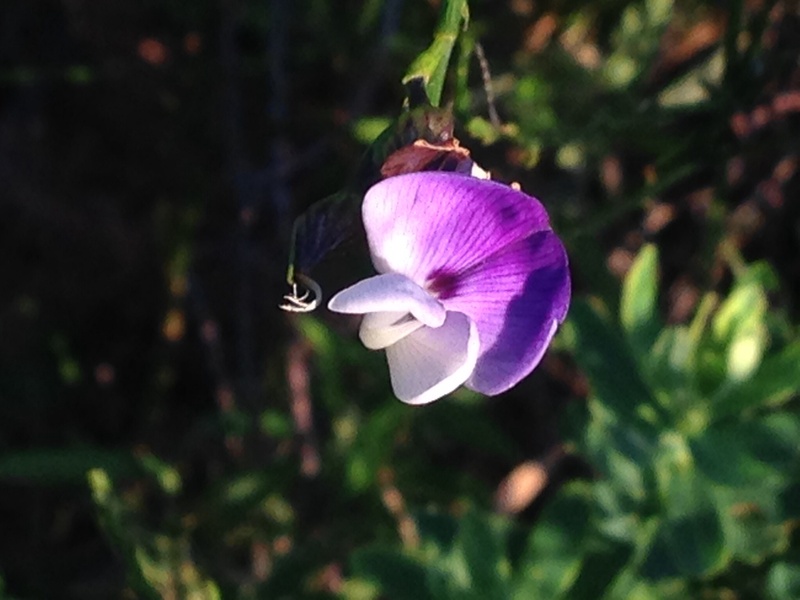 One is simply known as the Blue Pea, Psoralea aphylla, found in marshy places and along streams, which is exactly where we saw it. 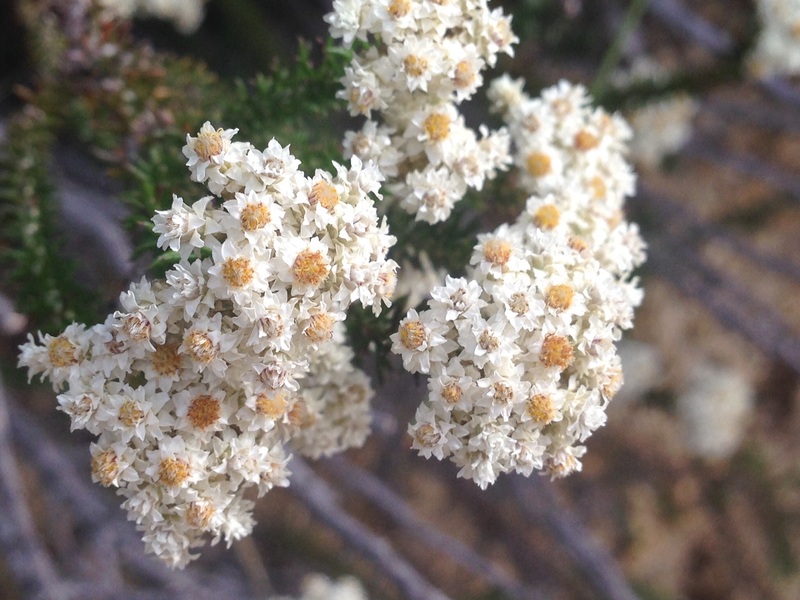 The other is prolific at the moment along the top road and very distinctive; I’m pretty sure it is Lotononis of which there are 40 odd fynbos varieties and only two are covered in my book. It isn’t either of those but the tri-foliate leaves and solitary flowers on slender stems are a bit of a giveaway.